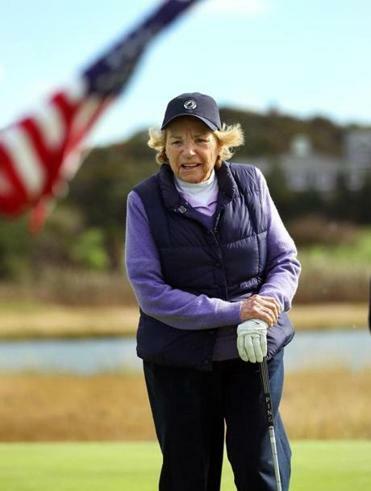 Ethel Kennedy in Hyannis Port in 2012. Members of the Kennedy clan decided to take on the “Ice Bucket Challenge” for ALS awareness recently during a sunny day in Hyannis Port. In a video posted to Facebook, Maxwell Kennedy, son of Ethel Skakel Kennedy and the late Robert F. Kennedy, introduces Ethel and several grandchildren — all lined up in a row with buckets of icy water — before they each dump the chilly mixture on their heads, one by one. Last but not least is Ethel, who stopped before pouring the water on her own head to call out President Obama to take the challenge. “Welcome to Cape Cod, President Obama. I nominate you,” she said. The Obamas are currently vacationing on Martha’s Vineyard. The Ice Bucket Challenge was designed to raise awareness and money for charity, and it has since gone viral online. This particular challenge started locally earlier this summer in support of 29-year-old Pete Frates, a former Boston College baseball captain diagnosed with Amyotrophic lateral sclerosis (ALS), otherwise known as Lou Gehrig’s disease, in March of 2012. The ALS Association reported to the Globe a significant spike in donations from July 29 through Aug. 12. The national office of the association has received $2.3 million during that span, compared with $25,000 in donations during the same time period last year. The donations the organization received association-wide, which includes national and chapter revenue, totaled $4 million, compared to $1.1 million during the same time period last year. The association reported that these donations have come from 71,100 new donors. How does this challenge work? A person who accepts it is videotaped explaining what it’s all about before being doused in icey cold water. That person must also nominate others through social media channels to take on the challenge within 24 hours. If those called upon fail, they are then asked to donate $100 to charity.